I had most of it done for about a week but the part I and most proud of? The moss ball (far right). You know why? Because it is the real deal - living moss. Not the fake floral aisle stuff. There is so much awesome mossy goodness floating around the blogosphere right now. I have a whole board on my Pinterest account dedicated to moss. 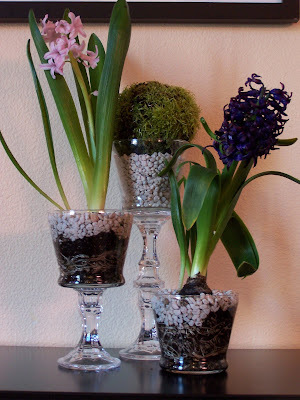 There are a couple great mossy rock crafts listed on Dollar Store Crafts. My favorite (as far as the fake stuff goes), though is this one from Make the Best of Things. I want to plant flowers in it, but what should I do with the moss? I felt bad just throwing it away. It needed a good home somewhere else. I really wanted to have a sphere shape ready-made for me. All I could find were half-spheres and they were $3.50 - $5 each! So that would be $7-$10 to make one sphere. No thank you. We're frugal crafters over here. So I improvised and picked up a 2 pack of short cylindrical wet floral foam from the Dollar Tree. A note on picking out foam: It's really important that you get wet foam. Dry foam is not going to work for this project. Read the label! Got your foam? Good. Go ahead and unwrap it and fill a large bowl or bucket with water. Add your foam and allow to sit until it if fully saturated and has sunk to the bottom. Take your foam chunks out of the water and place on a cutting board. If you have a cutting board with a little gutter, this would be the time to use it. Bust out your greening pins. Push one straight down into the center of the top of the stack. Then flip it over and do it again on the other side. Now we get to start carving. Remember back to your scouting days: cut away from yourself and keep in mind that it is easy to cut away more later than it is to replace foam if you cut away too much the first time. Take a small paring knife and shape the top half of the stack to make a rounded dome. Go outside and gather some moss if you haven't done so already. You want to try and peel the moss up in sheets as much as possible. I filled a dinner plate full of moss and I had ended up with enough to make 2 balls if I wanted to. Even if you did a pretty good job peeling up the moss, there is likely to be a fair amount of dirt, bark, bugs and small rocks stuck to the underside of your moss. Flip your moss over and gently scape some of that stuff off with the back of your knife to help the sheets be less thick and more pliable. This is the really fun part. If they aren't already, take some of your greening pins out of the package and make a little, easily accessible stack. 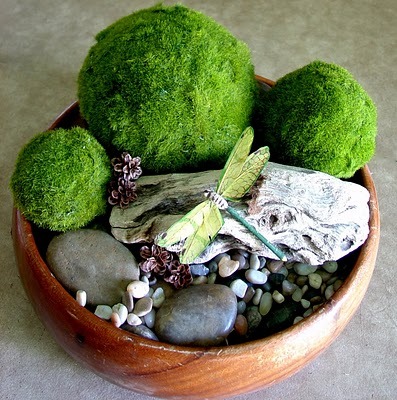 Now get one of your de-gunked sheets of moss and drape it over the top of your ball. Start pushing greening pins through the moss and into your foam ball to help the sheet of moss adhere firmly to the round shape. Keep going...draping and placing and pinning until the whole thing is covered and all the little cracks are filled in and you end up with something that looks about like this. Don't worry if you can see some of the pins now. In just a few days, the moss will grow over the pins and you won't be able to see them at all. The last part of this step is to gently rinse your new mossy friend under a gentle stream of water. This will help remove even more excess dirt as well as water your moss so it starts out nice and happy. Squeeze the ball gently to help get a little of the water out so it's not super soaked and drippy. Find your moss a nice home away from direct sunlight and somewhere where the dampness of the moss isn't going to ruin what it's touching. On a pedestal filled with small rocks or on a tray or bowl filled with gravel would be fabulous. I only needed one for now, but a set of three set up on the tiered pedestals you made out of dollar store materials would make an awesome centerpiece or look great on your mantel. A note about how to care for your new mossy friend: Moss loves moisture and isn't a fan of direct sun. You will need to either mist your ball every other day or every few days, run under a gentle stream of tap water to re-saturate. As a fellow Pacific NW girl, I hear ya loud and clear about the moss! It's really lovely, though, if you think about it. So soft and green and lush all year round! I love what you've done with it! I love this! Thanks for showing how to put it together. Love this tut. Have you tried it with 'tree moss'? We have access to a heavly mossed forest & wanted to know if the stuff that grows on trees is easier to work with since your don't have dirt to deal with. Thank you for sharing. Thanks for sharing, Brenda! Your ball turned out awesome! Winner of the Worm Factory 360! Worm Factory Review and GIVEAWAY!